The pavement markings are what caught my eye in this image on TV. Bike lanes in the middle of Pennsylvania Avenue! In both directions, no less. Albany has no streets wide enough for anything like that, but I was glad to see that in the nation’s capital, cycling was regarded well enough to try to make it relatively easy and safe on the most prominent street. Everybody else watching Friday’s TV coverage of the Trump inaugural parade probably thought of other things. 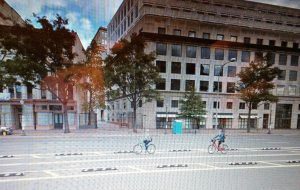 But the placement of the bike lanes on Pennsylvania Avenue was what caught my eye. I have not been to D.C. since the 1980s, a time when newspaper companies still had the money to put on annual meetings for the editors of their local papers. 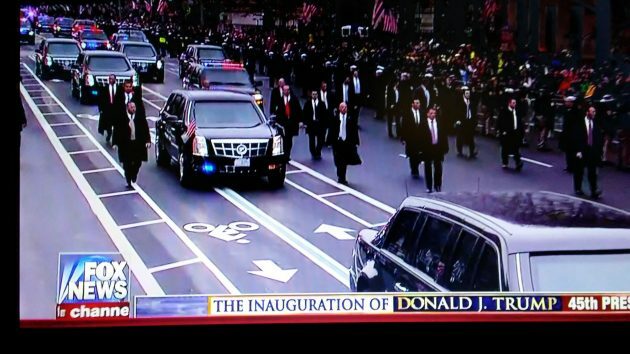 So the two-way bike avenue from the Capitol to the White House was news to me when I saw it on TV. I also wonder if some sort of passive barrier for the Albany/Corvallis bike lane would provide safety. It would not only need to provide, but give the appearance of safety before some bike folk would dare ride hwy 20. Given the recent survey showing the large number of people not looking at the path for commuting, but other activities, I’m wary of this solution. That said, I’d welcome it for my own personal use. The real breaking news here is that you watch that rw propaganda network known as faux news. Sure the painted lines & “bikes” on pavement are nice but damn I expect better of you HH ! *shakes head* The network of gropers and admitted (aka settled) sexual harassers. Are you trying to tell me that maybe, just maybe, some of the endless right-wing ranting about “political correctness” is justified? That there really is intolerance and a demand for censorship by the left? My introduction to political correctness came in the late 1970’s or early 80’s when William Shockley (good intro in Wikipedia) was to speak at a state university (not here). I don’t remember the details, but he was uninvited or something like that after protests by people mostly in my party. This upset me a lot because my right to hear him was infringed. The university is a place to gain wisdom by becoming uncomfortable facing contrary and unpopular viewpoints. Otherwise it might as well just be a technical and political training factory (China?). Events like this, even if much exaggerated by the right, have helped give us our demagogue-in-chief (without many tears from me). Some of my political views are as left-leaning as any found here among the comments. If I didn’t listen extensively to “the enemy” (mostly on talk radio), I wouldn’t realize how much they worship cheap meat, cheap energy, big cars, the “traffic engineering” mentality, car-bound suburbia/exurbia … and how much they hate any effort by government to promote health and happiness by getting people out of their cars and downsizing their bloated footprints. Seems history repeated itself this past week then when students at UC Davis shut down a talk by “alt right” hate merchant Milo Y.
Howling, no I’m not trying to tell you anything let alone call for censorship. Simply call that spade …well…a spade. That looks about as safe as jogging in a tiger cage. Pomp and circumstance ruled the day, but you likely picked up the most important thing. The above photo looks suspiciously like an “artists rendition”. I have been in D.C. on several occasions and have NEVER day or night seen any streets totally void of vehicles, parked or moving. It’s real, even though the sky looks colorized like 1950’s postcards. The building on the right is 601 Pennsylvania Ave. NW (north side of street). Street View of Oct. 2016. Just out of view are a tour bus on the left and a UPS truck on the right. Sometimes when I’m out with my bike and camera, I’ll try for shots like this, just as some photographers in the third world might sometimes avoid open sewers. Just because you “haven’t seen it” is not evidence of anything. Given our new “America First” administration, the leader of which has called to reopen West Virginia coal mines, I fully expect that we’ll be seeing coal-fired motor vehicles belching down the nation’s byways soon. Bicyclists will be forced to don those paper masks you see people in Bejing wearing when the cold air inversion press down on the lungs of innocents. We do not want to fall behind China as the world leader in air pollution. America First, Foremost and Always even if bicyclists’ are suffering Black Lung disease. Trump will soon be building an expressway to Moscow. An article about bike lanes in DC and the usual suspects use it to bash Trump. What a bunch of whining Chihuahuas nipping at the heels of their master. You should be whining about the loser candidate your party ran that couldn’t even beat Trump. Typical hypocrisy from “the party of tolerance”. When you grow up, you may actually realize that your preferred candidate loses about 1/2 the time. Don’t worry. As per Trump’s White House Special Advisor, Kellyanne Conway said today on Meet the Press, the White House is now countering nearly all the Lamestream Media Outlets by publishing it’s own “alternative facts” to slow the rapidly sinking presidency of our ADHD-Commando-in-Twitter Chief, a repugnant human and fake. ALTERNATIVE FACTS, aka lies. If that isn’t Orwellian New-Speak then nothing is. If Trump can sell trombones to the Yahoos in DC, just think what might happen here in River City, where the Rubes are far more naive. On the other hand, since the City, or is it CARA, or perhaps it doesn’t matter….is rebuilding downtown streets under Trump Infrastructure Spending Program with an “America First” undertone, City Fathers, Mothers and CARA aunties and uncles could use Eminent Domain imminently to widen downtown boulevards to include a bicycle lane just like in our nation’s das Kapital. This morning was profound to rise to a new name for LIES. Wow, just WOW! !